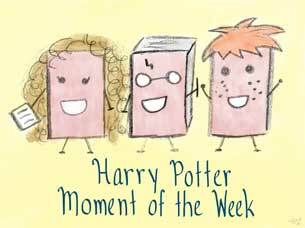 Rally the Readers: Harry Potter Moment of the Week (58): Could You Ever Double As a Spy Like Snape? Harry Potter Moment of the Week (58): Could You Ever Double As a Spy Like Snape? Could I ever double as a spy like Snape? Nope! There is no possible way I could ever be a double agent comparable to Snape. For one, I am a terrible liar. Secondly, I laugh when I'm nervous or in awkward/tense situations, like a lot. I would be discovered and killed off very early. Allison, on the other hand, would make a very good spy, being a skilled liar and very likable. One would only have to worry about which side she was really loyal to. Lee, sorry, but you're in the same boat as The Melissa. I am the some way, I am horrible at lying and I have an equally horrible poker face. And if that didn't tip them off, I would probably die of stress. It would be so hard to live with the knowledge that one wrong move, no matter how small, could get you killed. I would probably drop died of the stress long before they figured out I was a spy. Bahahaha Ula ^^ a crazy laugh like Bellatrix WOULD be handy - making yourself seem mental like her would probably make everything better. But yeah, I just know I wouldn't be able to pull off anything of the sort either. I'd start crying when they'd get to torturing and all that. Just a huge mess! I think I would be pretty good at Occlumency; I'm pretty good at keeping my thoughts to myself when I want, and I consider myself a good liar. However, I don't think I could handle the pressure that Snape was under constantly being around Voldemort all that time. I would eventually slip up, or crack under pressure. Especially since he had no support system to lean on. It would be horrible to be that alone. Here's my HP MOTW. ME TOO! I can't deal with awkward situations. I start laughing and it's not even funny! I feel the same! I'm so bad at lying and I'm an expert at being awkward. It would never work.